It’s about 10 years after I first started my work as a voluntary teaching assistant and I’m currently in the process of studying for my Level 3 Certificate in Supporting Teaching and Learning in Schools: TA Level 3 in basic terms. Why am I only doing it now? Well, that is a simple question with a much trickier answer. I started volunteering when in Secondary school and followed this through at University before returning to my Secondary school after graduating. I wasn’t sure what I wanted to do and friends had suggested teaching so I went to get some more experience after my initial voluntary work during Sixth Form. I’d ended up doing very basic teaching assistant work in the Music department and, because I was a good student, the staff were more than happy to have me helping out again. I even managed to teach some lessons while I was there, under the supervision of the class teacher and my students loved it. A chance encounter with one of my other teachers queried if I’d ever experienced Primary before I tried following a career in Secondary Music so I went to try and I loved it. I soaked up experiences like a sponge and completely rethought my future. Primary I could be so much more useful and creative. I really managed to connect with the children and I loved every minute of my volunteering. I ended up switching schools at the end of the year to gain experience in a different school and things completely changed. From a two form entry Junior school, I moved to a tiny village Primary school with under 80 pupils and a two year rolling programme. I’m very pleased I had this experience because working with two year groups in a classroom is quite a difference from one form or two form entry but for me it was like going back to really experience my first Primary school. Most teaching assistants may find they work with lower ability or SEN students. In this setting you have two groups of lower ability: one from each year. However, the entire year group may be all of 12 students. In my class at the moment I have 21 students who are the entire year 3 and 4, conveniently the class I had two years ago! I say conveniently because I need a ‘home’ group to work with for College and I already know these children. There are some schools that you just fall in love with. This was one of those schools. When my previous plans fell through and my finances took rather a large hit from my volunteering without any paid work, I signed up to an Agency and regretfully left this school for a year. I used everything I’d learnt gradually being a volunteer to be an official unqualified yet paid teaching assistant. My consultants were very helpful, interviewing me thoroughly to create a full profile of me to send to schools when contracts came through in the hope that schools would choose me. Sometimes, the consultants would choose their candidates for a contract then send them to the school. Despite being unqualified, I gained a significant amount of work and had schools requesting me to go back. In one year I worked at 5 different schools, had about 10 different classes I worked with, assisted during two Ofsted inspections (3 in one calendar year if you count the one my current school had back in October!) and gained a lot of experience. One single form entry Primary school, one Secondary Community Special school, one Middle school, one Pupil Referral Unit and a one and a half form entry Primary school gives a lot of children, teachers and experience. The teachers I worked with quickly realised I was good at my job. I followed and took my lead from them; I was willing to do anything and learn anything. I was comfortable working with the children and knew how to be professional. One lady, who I am very privileged to have worked with, told me, on my last day, that I was the best TA she’d ever worked with. Over the term I’d ended up being with her she’d been able to rely on me. She’d delegated to me. I’d sorted her paperwork, photocopying, displays, done guided reading, group work, assessments, cover lessons and just about anything else she trusted me with. I was her go to girl. When I left, a class of year 5 I’d had were in tears and I had a number of handmade cards off them. Clearly it is not just a teacher that has an impact on the children and their education! When I finished at my last school, I had a similar reaction though most of the children were more excited about the fact that it was the summer holidays but I will always remember the first few days of that contract. The third day in and first with the usual class teacher back from a course, I was asked how I worked. I told her I liked to generally have some idea as to how things worked but that I was quite happy to go with the flow. Then she stated that being Deputy Head she sometimes had to leave the classroom at a moment’s notice and asked if I’d be happy being left in charge, alone, in front of her class. When all that’s running through your head is ‘you barely know me, I barely know this school or these children’ always say ‘yes, that’s fine by me’. You will learn so much more and your school will appreciate it. Believe in yourself, you can do it. As my College tutor said, being a TA means you could be asked to take over the class at any moment so take any chances you are given as trials. It’s scary at first but you will get used to it and it’s a very privileged position to be in. So, why did I decide to do the qualification now? I’m not going to lie; I wanted to go into teaching and for various reasons, I’m not at the moment. As a result I’ve taken a side step so that I can be officially qualified. Although it was proven I was good at my job and was employable, lacking that piece of paper to say I’m qualified reduced my opportunities. It made me ineligible to apply for jobs in local schools because they all wanted the qualifications rather than knowing that you could do it without the qualification. At least through the agency, schools trust you more because you and your skills have been vetted by them. Would I advise anyone to go and be an Agency TA? It was great being able to experience so many different schools and so many teaching styles but you never know when, where or how long you’re going to be anywhere. If you can cope with being on call, by all means sign up and you won’t regret the experience. 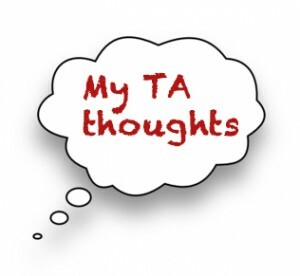 Would I advise doing the TA Level 3 qualification? There’s a lot of work to do in it and although you can do the bare minimum, I never do because I like knowing more. I’m half way through my class taught section in College but still have the in school assessment to come. I’m pleased I have a class of friends to help me through this first section rather than doing it as an online course by myself but I think I might leave my decision as to whether it was worth it until July! Would I change working with children? Not a chance. I don’t have any of my own and I’m in a privileged position to be able to work with them all day then go home and not have to worry about anyone apart from what someone else has on the TV but I really do love working with children. The look on their face when they suddenly understand things they didn’t before is amazing but it’s more amazing to know that you’ve helped them understand that. Beautifully and honestly written. Lovely. Its nice to hear of someone who is passionate about working as a TA. Would like to see more though on how TA’s who are like myself (single parent with children and bills to pay etc) cope financially while they’re training. Have seen a vacancy for an unqualified TA’s role at a special needs school, however the pay is only about £6 an hour!!! I know my reasons for wanting to be a TA aren’t financial however, you can’t be expected to survive on thin air!! !